19th December 1941 Sergeant-Major John Robert Osborn showcased the ultimate limits of human heroism As his group became divided from the main battalion in the hills of Hong Kong and had to withdraw against an overwhelming enemy he stayed behind to single-handedly engage the enemy while others ran to safety. After joining the others they soon found themselves surrounded by the enemy. Several enemy grenades were thrown towards them but the soldiers picked them up and threw back. 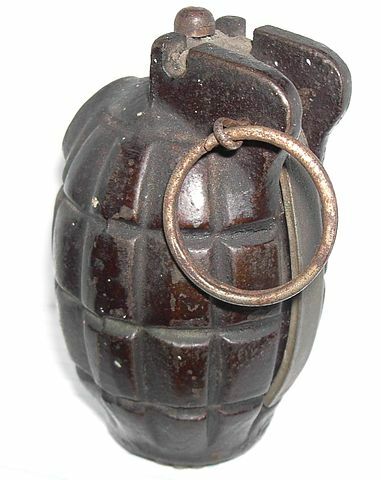 Suddenly, a grenade landed in a position where it was impossible to return it in time. To protect his troops, Osborn shouted a warning and threw himself on the grenade. He was killed instantly. There are many lessons to be learned from this dramatic real-life story. One of them is about human motivation. All too often we hear people saying that people are motivated solely by their own happiness. That human beings are self-interested creatures whose every single act contributes towards their own well-being. It would be quite absurd – and dishonoring – to say that John Robert Osborn was motivated by self-interestedness when jumping on the grenade. Instead we should see that he was moved by something that he considered to be so worthwhile that he was willing to sacrifice his life for it. Many people love to debate about whether human beings are essentially egoistic or altruistic creatures. In my opinion the whole distinction is founded on a mistake. The mistake is to think that altruistic behavior must be something which is against your personal motives. Instead we human beings can be motivated by many different things, some more related to our own well-being while others are more about the well-being of others. Osborn’s case was not an isolated incident. There are several recorded incidents of similar deeds of saving your comrades by sacrificing yourself. Less dramatic acts of self-sacrifice are a significant part of everyone’s life. So instead of this imaginary polarization between two opposing positions the real question is this: To what extent a certain person is motivated by his own well-being and to what extent by some wider concerns? Some people lean more towards egoistic end of the continuum while others are more able to take others into account. Test here where you are located. How egoistic or altruistic we are is largely determined by our cultural upbringing. Some cultures put more emphasis on self-interest while others learn children to value more the perspective of the others. In this regard there haven’t been many cultures during the course of human history that would have emphasized more egoism and self-regard than the current western culture. The catch is here: The way we see ourselves and others is a self-fulfilling prophecy. The more the politicians, economists, media and we all as individuals talk about human beings as rational and strictly self-interested, the more we become such cold and calculating creatures. And the more we have to suppress our natural tendency for empathy and regard for others. No wonder economy students demonstrate the least other-regarding behavior in tests. Yet despite this cultural propaganda to behave egoistically all of us transcend the limitations of such a selfish lifestyle and demonstrate remarkable deeds of acting in the name of the well-being of those around us. When the situation calls for it there are greater capacities for other-regarding behavior in us than most of us would ever imagine. John Robert Osborn’s act is a testimony for this. By emphasizing such acts and the general human capacity for empathy we can strengthen the other-regarding tendencies in our society and in our own lives. Therefore the most essential question as regards egoism and altruism is this: In what direction do you want to develop yourself and those around you? I agree w/everything you said, but I think that the psychological test could be questionable. It is well known that whether people will help others is related to if they have the time and opportunity to do so and also to whether there are other people in the situation who could help instead of them. Psychological distance also matters a lot. I did not get the feeling from the test that these things were adequately considered. In many of the questions the considerations I mentioned above would have affected my choices significantly as it would have those of others. But maybe It could be argued that the act was done because of his strict military training and ”military mindset” thinking, where the act was based on soldiers instinct. I do not think he had time to be moved by anything else than an instinct as everything propably happened in very short time. I do not think he had time to consider anything in such a short time. I agree. I do not think the philosophical question about altruism / egoism (however defined) is very interesting. What is interesting is the predictive power of a scientific theory or assessment. It seems inevitable that human beings are often motivated to do things that seem to mainly help others and harm self. So describing human behaviour not as egoistic or altruism (whatever they mean) is not very fruitful opposed to what you suggested in text. And as an economist I have to emphasize that economy as science tries to explain the economic behaviour that people are enganged in. Economists (theorists) try to build theories that are useful and have as much predictive power as possible. Economists talk about rational human beings as long as it is an useful approximation of human behaviour in some contexts. However your point is very valid. What we think we are and what we think we should be affects what we really are. That is why we should try to emphasize the social behaviour and leave the rationality and self-interested humans as economists tools. Actually now long after Smiths invisible hand we very well know that self interested behaviour often leads to worse outcome than co-operation, this kind of results can be found in game theory all the time. Most common example would be the prisoners dilemma (all though it might be better for the society if the prisoners stay longer in the prison ;)). Susanna: You are right in critizing that kind of psychological self-tests for the lack of context around the questions. Because when the questions are lacking proper context people fill out the context themselves. And this means it becomes doubtful whether we can compare two people’s answers as they might have answered completely different questions. That said, these questionnaires can serve important functions for example by revealing trends in larger populations. And for the individual filling the questionnaire, the most important thing is perhaps not the answer you get at the end of the test but the reflection that takes place when you answer the questions and˛have to think about yourself and your relation to the questions. Tuomas: You might be right that John Robert Osborn didn’t have time to do any serious reflection before he jumped on top of the grenade. And it might be so that he was captured by some sort of ’military mindset’ that made him act as he did out of instinct. That doesn’t change my basic point that he was acting out of something else than self-interest. It might be added that the mindset he was in was especially self-sacrificing as became evident already from his other acts before this final act of ultimate self-sacrifice. Already when he engaged the enemy single-handedly to allow the others to retreat he was demonstrating very other-regarding way of being. It doesn’t then matter if this ’other’ he was willing to sacrifice his life for was the military success of his home country or those men that stood close to him. But as said, whether the other-regarding mindset was an instinct or the result of reflection, the basic fact remains the same: it was self-sacrificing and other-regarding. About economics then: I’ve also understood that the point of economics is to explain and predict the economic behavior of human beings. The problem is that there are so many different ways through which human beings deviate from the picture of self-interested economic maximizers that it remains doubtful how predictive these economic theories are. It seems that many economists are more interested in the mathematical elegance and simplicity of the theory than its connection to the real world. And theories where human behavior can be reduced to a single law are more elegant than more complicated theories which try to take into account both human irrationality and our other-interested motivations. Luckily this has started to change and more and more leading economists have turned their gaze beyond rational and self-interested models of human beings as is evident for example in this conference attended by three Nobel prize winners. This kind of talk would be impossible without drawing a distinction between one’s enjoyments and other motivations. Stating that all human actions is motivated by self-interest or happiness flattens our psychological world to only one dimension. This means that one is able to see only one kind of motivations. And therefore makes it impossible to talk about different motivations conflicting. In real life, however, all of us have experienced situations where our own enjoyment is in conflict with something that we feel is worthy. And many times we sacrifice our own happiness for the sake of that more noble cause. In able to understand these situations we need a richer understanding of motivations than the one where everything is related to self-interest.